The Black Rhino, Diceros bicornis has suffered a catastrophic 98% decline across Kenya, whose population plummeted from 20,000 in 1970 to about 350 in 1983. The decline was occasioned by escalating poaching driven by an insatiable demand for rhino horn in the Middle East and Asia. In response the government of Kenya adopted the National Black Rhino Conservation Strategy and Management Plan, pioneering the establishment of rhino sanctuaries where animals are managed in small-often fenced and well-protected areas. 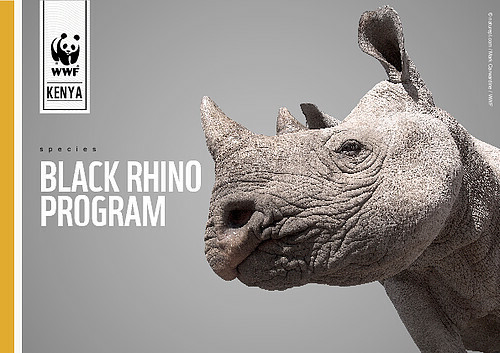 WWF Black Rhino project is focused on two National Strategic Objectives i.e. security and biological management. The two main challenges are securing long term funding for conservation and protection of Rhinos; and livestock incursion in rhino sanctuaries. WWF support is channeled through the Kenya Wildlife Service (KWS). WWF supports the national priorities of black rhino conservation within the framework and context of Kenya’s conservation and Management Strategy for the Black Rhino. 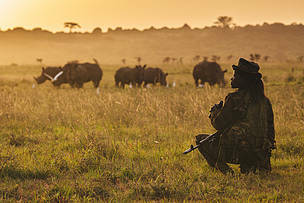 PROTECTING BLACK RHINO IN KENYA. It is a crisis of monumental proportion that at least one rhino is killed every month by poachers in Kenya. This is from statistics that indicate poaching incidents reported between January and August 2017 stood at 7 dead rhinos. With the heightened incidents of rhino poaching, WWF-Kenya working alongside the Kenya Wildlife Service has been able to boost the efforts in tackling the menace. Key among the interventions is deployment of technology with quite a number having been tested although very few have proven to be useful in terms of cost effectiveness & functioning, in the long term. Some of the technologies being used include. · Rhino horn implants and digital radio system. While the use of drone is yet to be fully authorized by law in Kenya, use of Thermal Imaging cameras has shown some tremendous outcomes as it has allowed the rangers to literally see intruders in the protect areas at night thus providing a 24/7 watch. The incorporation of the rhino DNA indexing system at the wildlife forensic lab at KWS has played a key role in prosecution of rhino related cases, where it is now possible to link a recovered rhino horn to a poached rhino thus solidifying the prosecution of the illegal rhino horn holder. WWF-Kenya remains at the forefront in supporting KWS with cutting edge technologies to curb poaching in Kenya’s wildlife rangelands. These efforts include the installation of 9 Thermo Cameras in the Lake Nakuru National Park, providing the FLIR (Forward Looking Infra-red) cameras mounted on vehicles in the Maasai Mara Game Reserve that has aided in nabbing more than 7 poachers as well as installation of microchips on black rhinos in both Maasai Mara and Nairobi National Park. The biggest achievement for WWF was the operationalization of the Rhino DNA indexing Laboratory located at the KWS headquarters in Nairobi. Rhino Ear Notching is a continuous process that WWF-Kenya continues to support with the sole aim of ensuring that each rhino has an identification mark. As a standard requirement in Kenya and other rhino range states, at least 60% of rhinos in a population need to be ear notched. This means Kenya has approximately 420 black rhinos notched, most recently being in the Nairobi National Park where 13 black rhinos were notched at the end of August 2017. For notching, the rhino has to be immobilized and at this stage they are also micro chipped for ease of monitoring. It is normally discouraged to provide in public the breakdown per various parks for security reasons, unless by KWS. However, we have a total of 696 black rhinos in Kenya conserved in the following areas: State lands (National Parks) with 49%; Private lands mainly Laikipia County (42%), County lands (7%) and Community land (2%) of the 696. Importance of Black Rhinos in the ecosystem. The black rhino is referred to as an umbrella species. Like an umbrella protects you from the rain, conservation of an umbrella species can indirectly protect many other species. Because there are millions of species of conservation concern and the resources available for conservation are limited, it can be useful to use umbrella species to make conservation decisions. In summary, when you save a rhino, you save an ecosystem. Illegal Wildlife Trade vs Terrorism. It is estimated that the illegal wildlife trade is a $7 billion to $10 billion per year business, with the profits used by the organisation to buy explosives, bullets and weapons and soldier’s wages. For example the Al-Shabaab has been funding upto 40% of its militant operations with funds from IWT (Illegal Wildlife Trade), according to Elephant Action League research. Sustaining terrorism requires substantial funding from its operatives. While some terrorists groups would convert the oil fields under their control into cash, the source of funding for terrorism from poaching is often overlooked. Wildlife products have become a substantial source of income for terrorist organizations in Africa, mainly due to the low risk and high reward associated with the wildlife crime compared to other crimes. With wildlife protection receiving far less funding than the fight against drugs and terrorism, rangers in the field are often left overpowered by heavily armed and well-financed poachers. While Asian men have for many years been blamed for supposedly buying rhino horn as a crude form of Viagra, the truth is that the main factors driving the illegal rhino horn trade is far more complex. Recent work by conservationists has shown that rhino horn is no longer used as an aphrodisiac, and this never was its main use. Its two main uses are ornamental and medicinal. In the Middle East, rhino horn is used for making ceremonial dagger handles; in the Far East it is used as an ingredient in traditional Chinese medicines.